The Kirov regional budget for 2009-10 reportedly suffered a loss of 1.3m roubles (£26,000; $40,000) and Mr Navalny was investigated as he was acting at the time as an adviser to Kirov's governor, Nikita Belykh. Mr Navalny is now accused of colluding with the heads of the two companies involved to organise the theft of timber worth 16m roubles (£300,000; $500,000). "This charge is strange and absurd," he said after emerging from the building. "They have completely changed the essence of the charge." "This is a mega-strange thing," he added. "Even the very figure of 16m roubles has not been explained at all." This winter saw the biggest anti-government demonstrations in Moscow since the fall of the USSR. 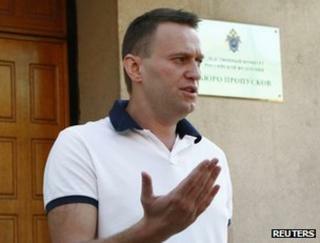 Protesters rallied around Mr Navalny, who accused Mr Putin's allies of rigging elections. In recent weeks, Mr Navalny, a lawyer by training, turned his fire on the SK's chief, Alexander Bastrykin, reports the BBC's Moscow correspondent, Daniel Sandford. Mr Bastrykin denied Mr Navalny's allegations that he had undeclared business interests in the Czech Republic. He admitted once owning a flat there but said he had given it to his first wife. As for commercial activity, he said: "I was never in business. Business in the sense of aiming to make a profit. If they can find a single euro in profit, I'll resign." "I will continue doing what I did before - nothing has changed for me," he was quoted as saying by AFP news agency.